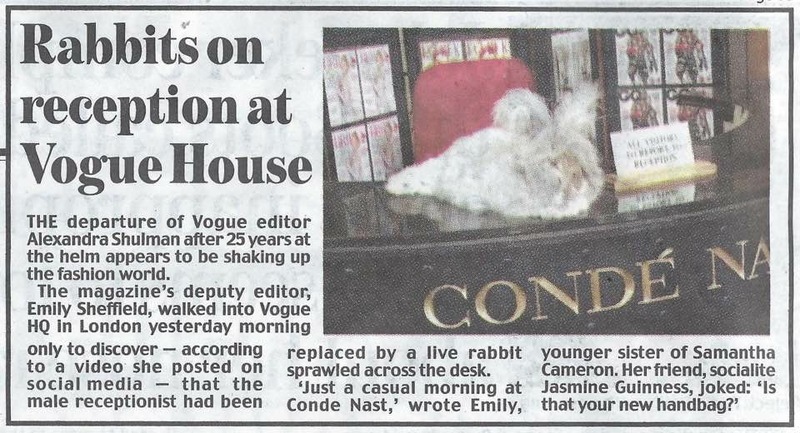 I was contacted by a representative of Tatler magazine back in early February. She had been given my name by Yvonne Hobbs-Fothergill as someone, who might be able to help as I lived closer to London. They wanted to do a video shoot of Angora rabbits, and could they have four of varying colours including a white, as fluffy as possible. Sounds easy, but even when you have a few, picking the most fluffy, friendly, good colours, without any problems is not. However, we planned to drive up as this was the only way you could take four easily, and we could park the car in their car park, so on 7th March we got up at four o clock, fed the rest and left for London, we arrived three hours later as traffic through London was very busy. I had decided to take Storm, a large sooty fawn doe due for clipping, very sociable, and Rufus a brown grey buck, lots of ear furnishings very bold and used to a harness, Peanuts a three month old blue doe, quite a long coat and a friendly little rabbit, lastly Elijah a white buck from Yvonne, very nice typy rabbit and friendly. On arrival we were taken to reception where Rufus was used to man the reception, he created a lot of interest by staff coming in an out of Conde Nast the headquarters of Tatler, Vogue and various other magazines. One of these photos ended up in the Daily Mail newspaper on Wednesday. As it was busy we then made our way through a maze of corridors and offices to the editorial office and Storm and Peanuts took over the editor’s office, who fortunately was away at the time. Elijah was seated in the editor’s office chair and Peanuts tried out a laptop. Elijah used the photocopier and Rufus looked on in his harness as he had decided it was mating time. They really wanted them all out together, but that was easier said than done, we managed a small footage of that before Elijah and Rufus found they were both males, and Storm spent the rest of the visit growling. Peanuts checked out some very glamorous shoes and a Chanel bag. 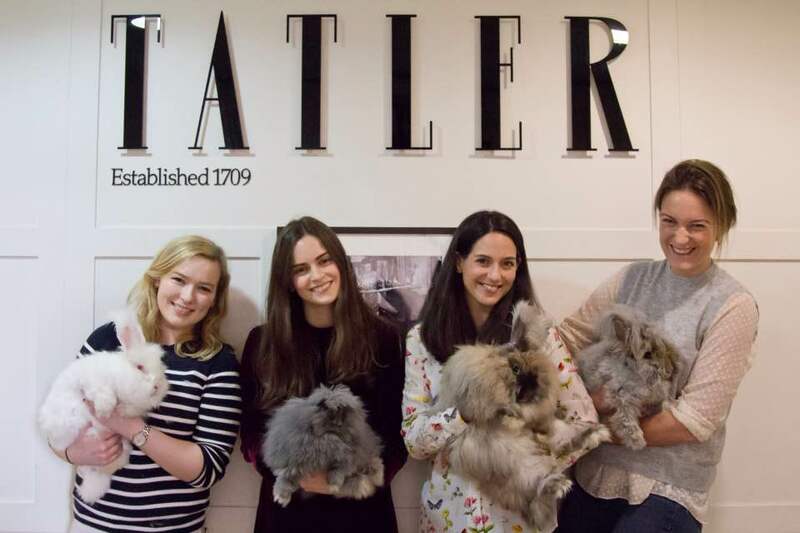 We stayed for about three hours and the last shot was of the four bunnies being held by the Tatler girls under the sign. We then left leaving a trail of fluff behind us, mostly on the very nice clothes of the Tatler girls, a velvet dress, black suit and a silk blouse. 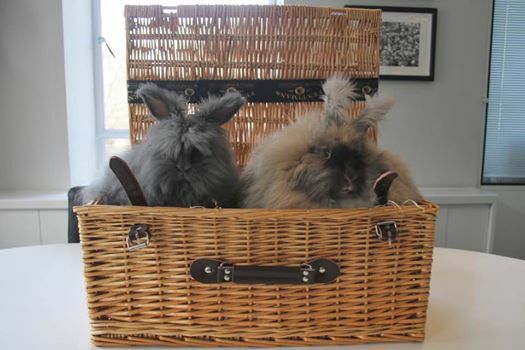 Fortunately the journey home was only half the time and the rabbits were returned to their hutches to chill out. They all seemed to enjoy the day and were quite relaxed. They are going to send me the video when it is finished, so I will add it to our facebook page. Posted 09/12/2017 by SM & filed under General interest, Members.